This is a result of the realization that magnetic tape has been used as the medium of choice in the recording industry for long-term archival storage of valuable recordings, and transfer to popular consumer media such as the vinyl record for the purpose of commercial release. This, along with the current availability of professional tape recording and reproducing equipment at very reasonable cost, enabled the curious to discover for themselves the virtues of tape. However, tape machines require precise adjustments in order to be able to deliver their best, and their operators will find it easier to work with them if they can understand the underlying principles of the technology. This applies equally to the engineer in the tape-to-disk mastering laboratory, the audiophile enjoying tape in the listening room, the recording engineer relying on tape to capture a performance, and the broadcaster engaged in international program exchange. Unlike disk records, tape is mostly used with equipment combining recording and reproducing facilities on the same, reasonably compact and relatively safe enclosure. Disk records require huge, expensive and complicated machine tools called “disk recording lathes” to be recorded. These machines usually cut grooves on blank disks covered in a layer of nitrocellulose lacquer, using a heated stylus, posing a serious fire hazard. They require pneumatic vacuum suction systems, powerful amplifier racks, a transfer console, and perhaps even a tape machine on top of everything else. The nitrocellulose lacquer disk can only be reproduced a few times, due to it being soft and fragile. Electroforming, dangerous chemicals, massive hydraulic presses, accumulators, steam generators, grinders, trimmers, extruders, and a whole factory full of industrial machinery is required in order to produce a disk record out of vinyl, which will be longer lasting. But, by the time you get to that point, it no longer makes sense to only make one copy of the record, from a financial standpoint. The average record enthusiast is blissfully unaware of all this. All they need to know of the process is the final product, the records in their collection, and how to use the cute, harmless record player in the corner of the living room. But they have no means of making records, they can only listen to them. The average tape machine, on the other hand, is not only limited to reproducing tape someone else has recorded. It can actually record on tape as well, while allowing the operator to listen to it on the spot, with no further processing! Not only that, but it actually sounds rather impressive, too! 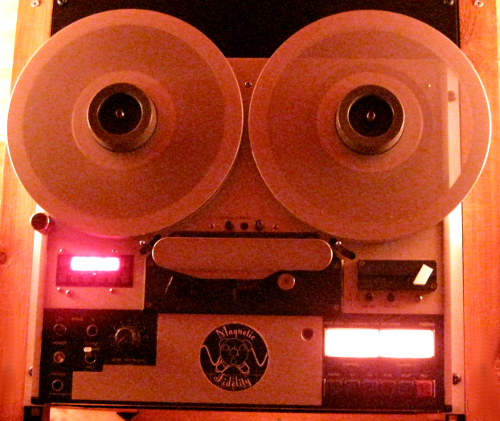 A properly functioning tape machine will do a great job reproducing a reel of tape recorded on the same machine. But what would happen if one should ever need to reproduce the tape on a different machine, in a different part of the world, perhaps even for professional purposes? Tape is a very versatile format. It comes in various sizes, can be coated with different magnetic particles, can be used at different speeds, at different operating levels, with different forms of bias, different equalization, it can be used as a single track or divided into multiple tracks, and so on and so forth. Not only was standardization of the different configurations essential, but thorough documentation of recorded tape was also necessary in order to make it possible to correctly reproduce the recording at a later date, elsewhere in the world. Different standards prevailed at different times in different parts of the world, and different machines were needed for each standard. Some professional machines could be switched between two standards, but this was about as flexible as it would get. Polarity, on the other hand was only standardized once and the same applies for all configurations and machines of any vintage. Unfortunately, this was often overlooked by manufacturers and service engineers, so many tape machines out there, as many as 50%, are inverting polarity. A very common misconception is that if you feed a polarity test signal to the inputs of a tape machine and you get the same polarity at the outputs, via tape, then the polarity requirements have been satisfied. This is only partially true, being the definition of “relative polarity” (output polarity relative to input polarity), but it does not tell us anything about the polarity on the actual tape (the absolute polarity). If the absolute polarity is inverted, it will be reproduced with inverted polarity on a different, correctly set up tape machine. According to the standards, the most recent of which is the AES26-2001 (r2011), a positive signal voltage at the input of the system shall result in magnetization of the tape in the direction of its motion. This defines the absolute polarity stored on the tape itself. Further, the standards also mention that the relative polarity between input and output shall also be maintained along with correct absolute polarity. Several good articles have been written on this topic. Apart from three articles which caused some controversy by proposing an opposite standard [7,8,9], all others are in agreement with the standards. As with disk records , the most reliable method of verifying the absolute polarity of a tape machine is by reproducing a test tape containing a suitable signal for polarity check, and observing the output on an oscilloscope. Once the reproducing function is verified (and corrected, if necessary), the recording function can be verified by applying a suitable signal at the input and observing the output, via tape, on an oscilloscope. It should be of the same polarity as the reproducing function. Suitable polarity test tapes have been available from different sources, so ask around. Keep in mind that asymmetric square wave type signals will appear altered on most tape machines due to the effects of phase shifts. It should still be possible to identify the polarity though, even on a heavily altered wave form. In the absence of a polarity test tape, the polarity of the reproduction function can also be verified by means of an induction loop, simulating the tape magnetization. This is based on the principle that the direction of the magnetic field surrounding a conductor has a clearly defined relationship to the direction of current flow through the conductor. This method is described in detail in the standards and relevant literature, and the principle is explained in textbooks on electronics and electromagnetic theory. There are various test signals that can be used to verify the polarity of all manners of audio equipment. In “Absolute Polarity for Disk Records” , several asymmetric signals were presented. While the half-wave rectified sine wave , the half-wave rectified sawtooth wave  and the asymmetric square wave  will all work well, they are by no means the only signals one could use. In a recent discussion , Tim de Paravicini presented a signal of his own invention, which he uses to test polarity. It is a gated sine wave, with every other period off. Essentially it can be thought of as a toneburst, one cycle on, one cycle off, of a sinusoidal waveform, as displayed on an oscilloscope above. Unlike all the other polarity test signals mentioned earloer, this one is actually symmetric. It is also far more tolerant of the bandwidth and phase response limitations of the systems to be tested. One could of course also try all kinds of variations on this theme, such as gating a sawtooth wave instead of a sine wave, to also provide direction information apart from polarity , or doing two cycles on, two cycles off, or any other combination. The type of test signal used is decided based on the particularities and complexity of the investigation. Back in 1991, Keele  used a 6.5 cycle sinusoidal toneburst to investigate phase shift and polarity, or as he called it, “polarity at different frequencies”. For a simple verification of polarity, any test signal will do. But, if other parameters also need to be investigated, some signals may no longer be suitable. If you want to go into murky territory, you might be better off designing a test signal particular to your requirements. Since tape was the most popular source from which disk records were manufactured, and an extremely popular medium on which professional recordings were made, the preservation of the polarity of such recordings requires adequate knowledge of the polarity of the tape machine originally used, and the machine which is going to be reproducing the tape. This required documentation of the tape, either in writing, or by including a suitable test signal for polarity verification along with the rest of the test tones on the tape. Additionally, the polarity of the reproducing machine must be verified, preferably by means of a polarity test tape. Record labels releasing albums on 1/4″ tape should encourage the preservation of polarity by clearly stating if their duplication equipment conforms to the relevant standards, by including a polarity verification signal and test tones on each tape, or by making available a calibration tape for the audiophile to be able to align their tape machine to the same standards as these used by the record label. When tape is used for tape-to-disk mastering purposes, it is important to be able to verify the polarity on the tape itself, the polarity of the tape reproducer, but also the polarity of the disk mastering system itself, as described in “Absolute Polarity for Disk Records” , to ensure that the absolute polarity on the disk is conforming to the standards. The audibility of polarity has been discussed previously , but I will point out once again that the full potential of the tape medium cannot be realized, unless all operating parameters are precisely adjusted and standards are observed, including but of course not limited to the issue of absolute polarity. Last but not least, at present there are several concerns involved in the development of new tape machines. I hope this article will encourage them to correctly implement the standards and document how their products should be tested and adjusted for best results. Records,” Agnew Analog Blog, 2018.
dio Engineering Society Inc., May 2011.
netic recording and reproduction,” Tech. MRL, “Polarity Calibration Tapes,” Tech. vol. 7, p. 14, May 1979.
nal Post by Marco Esposito ,” Oct.
2017 (Retrieved on March 16, 2018). gineering Society Convention 91, Oct 1991.